In both life and music, Jade Novah knows how to stay above the clouds. 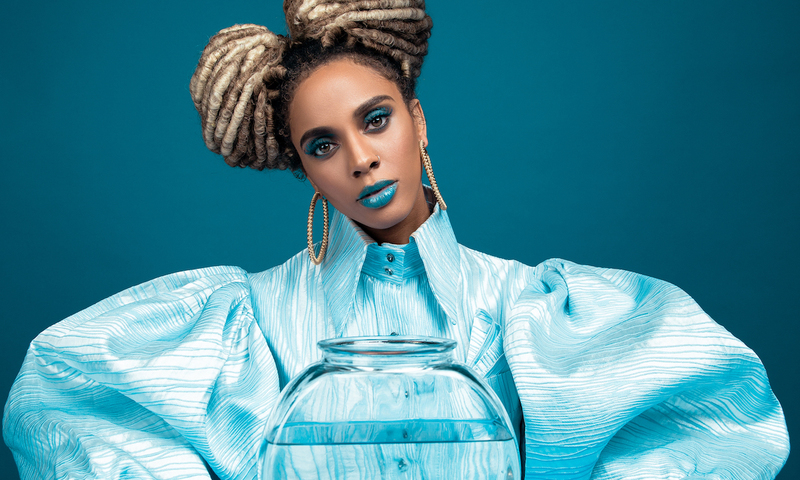 On her recent debut album, All Blue, the multidimensional artist emulates positivity, introspection and higher-level consciousness and somehow manages to maintain a mainstream appeal. That’s the beauty of our TIDAL Rising Artist of the Week, Jade Novah. And if you weren’t here earlier this week to read up on the singer-songwriter-actress, then we’ll note that her accolades stretch from singing backup for Rihanna to getting a Stevie Wonder cosign and, not to mention, doing spot-on celebrity impressions and song covers. Prior to the release of her debut, Novah chatted with us about her complex creative history. In this Q&A, she takes us through her backup singing days to meeting and working with her husband and producer, Devin Johnson, and her personal relationship with the color and concept of blue. What did you do musically before you started working on this album? I was a background vocalist for several different artists over the years — Rihanna primarily. I toured with her on and off for four years, and then I toured with Eminem in the midst of that. I did the Soul Train Awards, Emmy Awards, BET Awards. Just doing a lot in the live and album, background space for a few years. I also wrote for other artists. I got my first placement with Melanie Fiona. I wrote “Watch Me Work” with Melanie Fiona, and I was just doing a lot of session work with different artists — Christina Milian and Mya. I just kind of lived in that space for a while as well before meeting [my husband] Devin. I met him in Atlanta in the midst of writing for other people and we both were in that space of wanting to stop chasing placements and create something where we could maintain our creative control and musical integrity. That’s when we started working on the Jade Novah project. At what point did you write “All Blue,” and why did you decide you wanted to introduce your own music with that song? We were working on the album over the course of nine months. We were doing a lot of things at the time. “All Blue” was towards the middle of the project, and I knew that it would be a good introduction to the album because, before writing it, everything we had been creating had an underlying theme of elevation of operating in a higher space or loving in a higher space. So, “All Blue” encompassed all of that but in a way that felt really good sonically and it explained and set the tone for everything on this project. It just naturally became the frontrunner. Can you get into what the song means to you? What were your thoughts when you were writing it? I’m a millennial, so we’re in this day and age where we have access to information and we’re able to question everything and unlearn things that we were taught before we got to this space where we are now. “All Blue” is really just a metaphor for elevation, just thinking in a higher space, loving in a higher space. “All Blue” represents existing in the sky, a metaphor for looking down at the world and being able to see things outside of your own day-to-day distractions. “We’re all made up of stars” is a cool line from the song that’s just saying that all of us are connected, we’re all made of the same stuff that the universe is made of. We have the power to control our own destiny, and we’re all magic. It’s really just owning our power, elevating. Everything’s all blue, it’s all good. How do you view what the actual color blue represents? Even before I released the audio for the song, a lot of people thought it would have a somber element. When you think blue, you tend to think sad or depressed. But blue is really a powerful color. Our water is blue, our sky is blue, everything that gives life. I’m an indigo child. It just speaks to me. What was it like to work on this project with your husband? It’s really cool to me. Honestly, before dating my husband, I never thought I could be in a relationship with someone I work with so heavily. You’re kind of conditioned to think that the two can’t coexist. For us, it’s really just enhanced both parts of our lives. You guys have so many different influences on the album. What were you guys listening to when you were making the album? We both really come from an eclectic background and listen to a little bit of everything. Musical theatre was a strong part of my musical foundation because my mother was really into it. Devin used to play in the church growing up, and in black church, the culture of music is so heavily rooted. The music is a place where you can be uninhibited and create things a little more unorthodox and have it be accepted by the masses. We listened to a lot of things that were timeless, and we listened to a lot of trap, a lot of mainstream music to find a way to bridge the gap. We wanted to create something that could live across all channels and create something that still feels cohesive. Did your background in covering songs help you be able to use your voice across genres? Absolutely. And also writing and singing background for other people. As a background singer, that’s an art in itself —the ability to match the tone of each artist that you’re working with. And the acting side where I’m able to impersonate other artists and writing for other artists where I’m able to capture the essence of their art. Speaking of impersonations, how do acting and comedy play a role in your career? I want to do all of these things. In wanting to do all those things, it felt like I had to do them all at one point. And now, as I’m putting out this album, I want to be able to do all these things but let them live in a place that makes sense for them. Comedy is more than a hobby, but right now, I just want to focus on each one of those things in separate spaces. Acting absolutely plays a role because it even has to do with setting a tone for these different sorts of songs that I’m doing — to be able to go in and out of character if I’m doing a hip-hop record or if I’m doing more of a ballad. There’s also comedic elements to the live show as well, so it’ll all be there. Tell me a little bit about making your music videos. Who were the directors? Gerard Bush and Christopher Wrenz. Together, they’re Bush Wrenz. They shot all three of the visuals all in one day. We had a 15-hour window to go from place to place and get as much footage as we could. They’re good friends of ours. They shot some of the visuals from [JAY-Z’s] 4:44. They shot my very first visual that I did back in 2013. We shot in Malibu. I was just surrounded by friends and loved ones.